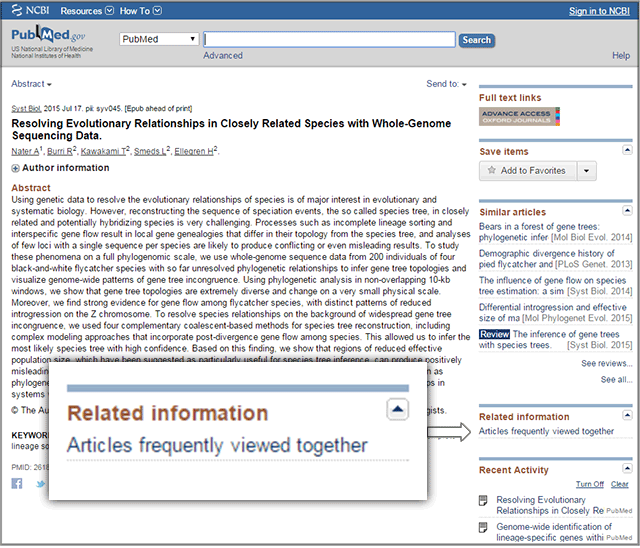 In a recent post, we described a new way to search our databases in NCBI Labs. We have now added a suggestions dropdown to the search bar that should make life easier for many NCBI visitors. The as-you-type suggestions are simple, natural language-like queries we described in the previous post. They’ll help you avoid typos and save time if you’re searching for organisms with long or hard-to-spell names. These suggestions are meant to direct you to high value results. As we improve the search experience, you may notice changes to the suggestions. We welcome your feedback on ways to enhance this new feature. Almost two years ago, we launched PubMed Journals, an NCBI Labs project. PubMed Journals helped people follow the latest biomedical literature by making it easier to find and follow journals, browse new articles, and included a Journal News Feed to track new arrivals news links, trending articles and important article updates. PubMed Journals was a successful experiment. Since September 2016, nearly 20,000 people followed 10,453 distinct journals. Each customer followed 3 journals on average. Though PubMed Journals will no longer exist as a separate entity, we hope to add its features into future NCBI products. We appreciate your feedback over the years that made PubMed Journals a productive test of new ideas. NCBI Labs is NCBI’s product incubator for delivering new features and capabilities to NCBI end users. About two years ago, NCBI launched PubMed Labs, a gathering place for discovering and experimenting with new features and content for NCBI’s family of websites. Over those years, we launched a few experiments that have helped us learn more about our customers and how we can serve them better. Today we’re happy to announce that we’re expanding PubMed Labs to a broader set of experiments called NCBI Labs. To better convey the breadth of upcoming experiments on data, services, and websites that NCBI offers now and hopes to offer in the future. You can expect to see new features, content, and other experiments from NCBI Labs in the coming months. To reserve the name “PubMed Labs” for an exciting new set of experiments around biomedical literature and especially literature search. This blog’s menu item and blog category “PubMed Labs” will now appear as “NCBI Labs”. Existing links will continue to work. We won’t be updating the old blog posts, for the most part, although some links on existing sites (e.g. on PubMed Journals) may be updated to use the new name. Following the latest biomedical literature can be a challenge, but NCBI’s new PubMed Journals will help you keep up-to-date. This blog post is intended for all BLAST users. ORFfinder is a graphical analysis tool for finding open reading frames (ORFs). We’ve been working on a few updates, and we’d like to find out what you think about them. Read on to find out what you can do with the new ORFfinder.